Atlantyca is ramping up its licensing and consumer products efforts in western Europe for their popular Geronimo Stilton brands. The company has tapped J & M Brands as a new licensing agent (Benelux) for their Geronimo Stilton brands and all of its character spin-offs and has signed Da Wakkere Muis (Amsterdam) as a licensee for Geronimo Stilton: Kingdom of Fantasy. 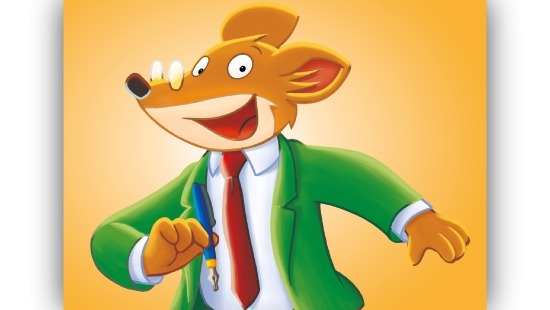 Benelux-based leading brand licensing agent J & M Brands has been appointed the exclusive licensing agent for Atlantyca’s popular Geronimo Stilton brands and all of its character spin-offs. The company will develop dedicated promotions and create a line apparel, toy and a variety of back to school products. “Western Europe has turned into a key territory for our overall European licensing plans, this region hosts a variety of companies in food and textile categories with a multi-territory possibilities, offering an enormous amount of new product potential,” noted Marco Piccinini, Atlantyca’s Licensing Manager. “Over 4 million copies of the books have been sold to date and continues to grow in addition to the success of the animated series currently being broadcast, we see this has an ideal time to begin an expansive licensing program and are thrilled to be working with J & M Brands and Da Wakkere to begin our plans.” In addition, Atlantyca Entertainment is expanding its relationship with Da Wakkere Muis, appointing the leading Dutch Publisher as the exclusive licensee for the Geronimo Stilton: Kingdom of Fantasy brand. Da Wakkere Muis is currently the publisher for Atlantya’s Geronimo Stilton book series and its spin-off Geronimo Stilton: Kingdom of Fantasy books. Commencing November 2017, Da Wakkere will seek to secure a line-up of kids merchandise and promotions seeking partners for games, re-writeable activity cards such as crosswords, mazes, spot the differences, etc. The company previously represented and created the same products for the Geronimo Stilton Classic brand. The Geronimo Stilton: Kingdom of Fantasy books are known for capturing the children's imagination. While there are several different series within the Geronimo Stilton franchise, the Kingdom of Fantasy focuses on Geronimo's adventures in a magical land filled with fairies, dragons, and other creatures. The Geronimo Stilton books have sold 4 million to date in the region. Atlantyca’s robust line-up of licensing agents, including: Brank Monk Licensing (BML) (India); BRB for Iberia (Not only Spain, also Portugal); Licensing Locomotive for Eastern Europe The company attends BLE seeking key licensing partners and agents for China and Latin America.